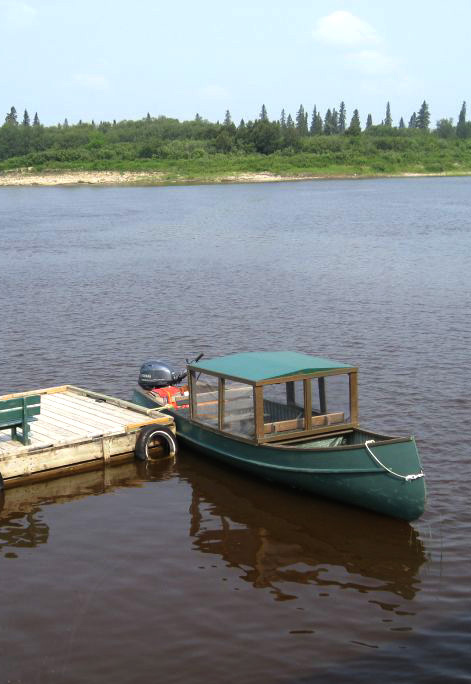 Cree Village Eco Lodge is situated in Moose Factory, Ontario, an island community located between the shores of the Moose River near where the Moose River meets the ocean waters of James Bay. Here in the heart of the Hudson Bay watershed, Cree people have subsisted for millennia. In many ways, it is the economic birthplace of modern Canada. Once a part of what was known as Rupert’s Land, the area is comprised of a rich ecosystem that includes, in part, a teeming wildlife population of black bear, woodland caribou, marten, beaver, wolf, fox, lynx, moose, sturgeon, pickerel, northern pike, whitefish, and numerous varieties of trout. Due to this rich animal life, the Hudson Bay Company established a post at the mouth of the Moose River in the 1600’s, making Moose Factory the oldest existing community in Ontario. Just outside our doors is Ontario’s only marine saltwater habitat and the entire James Bay sub-arctic region which is situated in the heart of the Hudson Bay Lowland. This vast swampy plain sloping gently towards the west and south shores of James and Hudson Bays occupies 324,000 square kilometres, and is one of the largest wetland areas in the world. More than 85% of the area consists of different types of wetlands: fens, bogs, marshes, swamps and ponds. These wetlands are dissected by a number of major river systems. The slope of land is so shallow that mudflats are exposed for 1-5 km at low tide. Moose Factory Island is situated three miles east of the mainland community of Moosonee. Moose Factory is remote, with access by air and rail only. AirCreebec offers daily flights between Moosonee and Timmins. Rail access is provided by Ontario Northland which offers a 4-5 hour trip to and from Cochrane —daily during the summer on the Polar Bear Express, and three times weekly throughout the year on the Little Bear. Travel from Moosonee to Moose Factory island varies depending upon the season. In late spring, summer and early fall the river is ice free and water taxis use freighter canoes to transport people between the two communities. The water taxis can be found at the public docks on the Moosonee side, and they will drop you off at the dock at Cree Village Eco Lodge. A regularly scheduled barge also connects the two communities, transporting vehicles and large items. During the freeze-up and break-up periods of early spring and late fall, the only means of transport is by helicopter. In winter, once the ice has solidly formed on the Moose River the Public Works department prepares the ice road for winter travel. Taxis and trucks travel back and forth across the river all winter.